Hi, I need to order multiple toners for the Phaser 6130 printer, but have two questions. I tried non-Xerox toners in my printer, and it says "Invalid Toner". Will your non-Xerox cartridges work? Will you ship them to Portugal (usually UK shops send me goods through Royal Mail)? Thanks, Nuno. Our compatible Xerox Phaser 6130 toner cartridges are only guaranteed to work in a Phaser 6130 printer that was purchased in the UK and we can only deliver within the United Kingdom. Allowing you to save on your Xerox Phaser 6130 cartridges is what we’re committed to because we know that using your Xerox Phaser 6130 over and over is a given as the Phaser 6130 is so efficient and effective. The Xerox Phaser 6130 is capable of printing up to 16 black pages per minute which ensures that you can use the Xerox Phaser 6130 to create documents quickly. Using your Xerox Phaser 6130 on a regular basis can lead to a large bill because the Phaser 6130 utilizes a number of Xerox Phaser 6130 cartridges which need to be replaced after a while, like the black Xerox Phaser 6130 toner cartridge. A lot of Xerox Phaser 6130 suppliers charge you high prices for their Xerox Phaser 6130 toner, you can compare Xerox Phaser 6130 cartridge prices to find out. Luckily, our cheap Xerox Phaser 6130 toner cartridges are available at incredible discount prices so that you can use your Xerox Phaser 6130 with ease. The Xerox Phaser 6130 toner cartridge comes with a bunch of excellent services so that you get your Xerox Phaser 6130 toner without experiencing any hassle. You get your Xerox Phaser 6130 cartridge with guaranteed free delivery so that you can get your Phaser 6130 toner cartridge quickly and without any stress. We also have a no quibble money back guarantee policy on all the Xerox Phaser 6130 toner cartridges so that you know for sure that we only deal with quality Xerox Phaser 6130 cartridges that you can rely on. The Xerox Phaser 6130 is a colour laser printer aimed at the small business and home business consumer who needs professional quality laser printing in both monochrome and colour. While this model is not currently available new, it can often be found second hand or refurbished. It is capable of printing up to 12 pages per minute in colour and 16 pages per minute in black and white. It comes with standard network connectivity and uses the Postscript 3 printing protocol. This Xerox 600 x 600 dpi printer is designed to produce vibrant professional quality results in both colour and black and white due to the use of the high grade Xerox 6130 toner used in the device. The Phaser 6130 is built for typical office use with a 40,000 page duty cycle and a large 250 sheet paper tray. 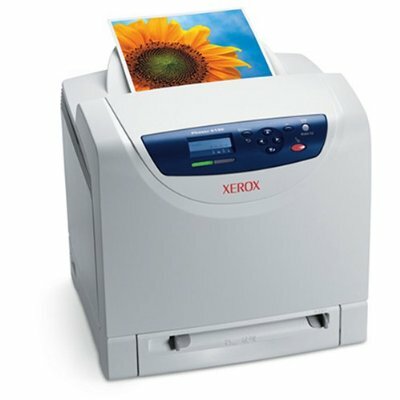 It can handle envelopes, labels, and other non-standard paper types as well as most paper sizes expected of a printer in this class. The printer is compatible with a wide range of older Windows variations and business server class Linux installations that are not as well supported with newer printers. This Xerox printer is designed to be easy to use and simple to install for most home and small business users. The Xerox 6130 cartridges come pre-installed, allowing for a quick time from opening the box to printing the first document. The Xerox 6130 is an older colour laser printer that has built a reputation for being reliable, easy to use, and durable over time. The printer is well supported enough to work with a variety of production grade server operating systems without problems, and functions well as a slow but reliable workhorse printer for businesses who occasionally need access to high quality laser printing. The low cost of purchasing this printer used combined with the easy availability of compatible toner makes the Xerox 6130 a solid choice for inexpensive reliable printing. The age of the Phaser 6130 make it no match for most modern laser printers in either print time or feature selection. Unlike most modern options, it does not include multiple functions or many modern features that most currently take for granted. The age of this printer also means it may not be supported by many recent operating systems.